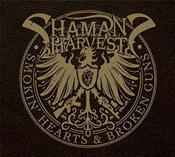 Share the post "Album review: SHAMAN’S HARVEST – Smokin’ Hearts & Broken Guns"
If you had a secret liking for ‘Hero’ the Chad Kroeger song that featured Saliva’s Josey Scott in the original re-boot Spiderman movie, you will like Shaman’s Harvest. The band had some U.S. success with their debut ‘Shine’ (2009) which featured the standout song ‘Dragonfly’ – included here in acoustic format. Surprisingly, the band’s four previous albums (with the exception of that debut) do not seem to be freely available so maybe a re-evaluation/reissue campaign is long overdue? Vocalist Nathan Hunt was diagnosed with throat cancer at the start of the recording sessions and this no doubt infuses the work with extra passion and emotion. Starting with ‘Dangerous’, the album grabs you from the start and is filled with Nickelback-patented hooks and riffs, with a nod to Bush and Shinedown, and full of fist-pumping, arena-bound, action. This is reinforced with tracks like the anthemic ‘Ten Million Voices’, and ‘Blood In The Water’ the lyrics of which give us the album title. Hunt’s vocals are wonderful throughout, but especially on the slower pieces like ‘The End Of Me’ and a superb ‘Silent Voice’. Perhaps bizarrely there is also a song called – wait for it – ‘Hero’ (not that version) whilst the band also ring the changes with the rocky ‘Country As F**k’ and a cover of Jacko’s ‘Dirty Diana’. This entry was posted in ALBUM REVIEWS, ALBUM REVIEWS (Mobile), All Posts and tagged album, alt rock, post grunge, review, Shaman's Harvest, Smokin' Hearts & Broken Guns. Bookmark the permalink.